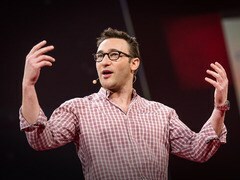 Simon Sinek explores how leaders can inspire cooperation, trust and change. He's the author of the classic "Start With Why"; his latest book is "Leaders Eat Last." Fascinated by the leaders who make impact in the world, companies and politicians with the capacity to inspire, Simon Sinek has discovered some remarkable patterns in how they think, act and communicate. He wrote Start With Why: How Great Leaders Inspire Everyone to Take Action to explore his idea of the Golden Circle, what he calls "a naturally occurring pattern, grounded in the biology of human decision making, that explains why we are inspired by some people, leaders, messages and organizations over others." His newest work explores "circles of safety," exploring how to enhance feelings of trust and confidence in making bold decisions. It's the subject of his latest book, Leaders Eat Last. 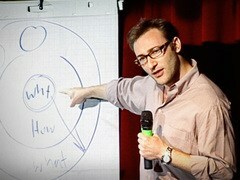 An ethnographer by training, Sinek is an adjunct of the RAND Corporation. He writes and comments regularly for major publications and teaches graduate-level strategic communications at Columbia University.